Fine of £5 and costs of £3 9s 6d on Wednesday 1st June 1892 for selling alcohol on bowling green. Convicted 09.05.1927 of selling out of hours. Closed 1942 due to enemy action. Reopened 15.07.1943 in temporary building. c1895 image - Thanks to Elaine Fenton. Licence of the NURSERY TAVERN finally removed to new premises 1887. Sign changed to the TRAFFORD ARMS. 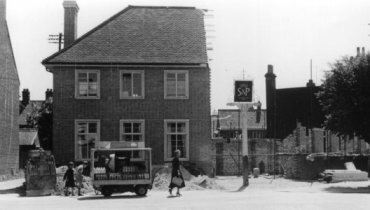 The new premises had been erected some 200 feet from the site of the Nursery Tavern, allowing the road to be widened by 12 feet. Robert Allen made an application, on Monday 24th August 1891, for a music and singing licence for the convenience of some fifty musical union members who met in the club-room. Also for occasional music in the bar parlour. On Wednesday 1st June 1892 landlord Robert Allen was summoned for unlawfully selling liquor at the bowling green on 12th, 19th, 22nd and 23rd May 1892. The licence of the NURSERY TAVERN, (run some 30 years previously by the father of Robert Allen), had been transferred to the Trafford Arms. The licence then had allowed selling liquor at two bowling greens, one adjoining the house and another 130 or 140 yards distant. 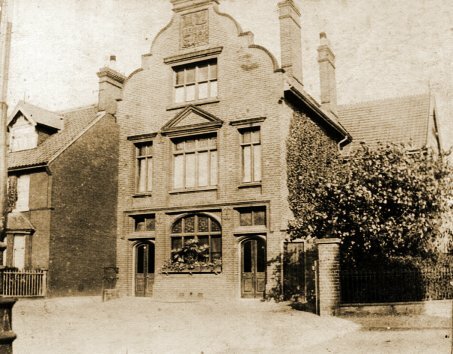 The Nursery Tavern paid a licence fee of £25, whereas a licence for the house only would have been £17 per year. When the Nursery Tavern closed in 1886, the licence had been transferred to the new house and the payment of £25 had contiued. The Town Clerk argued that Mr. Allen could not be innocent since he hired the public house from Messrs. Steward & Patteson, but the distant bowling green, at which Mr. Allen had sold liquor, was under separate hire from Mr. Trafford. Liable to a fine of £50, the magistrates inflicted a fine of £5 and costs of £3 9s 6d. In 1903, following disagreement about the price of teas, the Victoria Bowling Club ceased to meet at the Trafford Arms. Severely damaged by enemy action June 1942. Trading recommenced 15th July 1943 from a temporary wooden hut. Transformed it into a Free House cask beer oasis'. One large open plan bar room. Decor all Modern / Tudor reproduction. Large `U' shaped bar counter set against back wall. Wood panelled with turned supports for wooden glass rack above. Modern brick fireplace with brick overmantles. False ceiling beams covering RSJ's have bracketed timber supports.